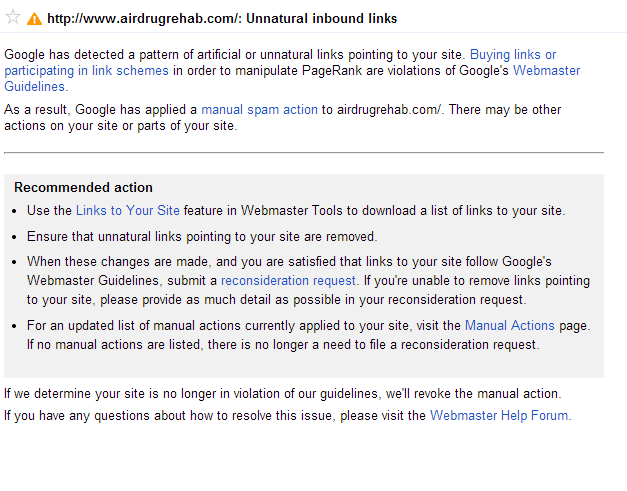 As you know, Google's Matt Cutts publicly outed that Google went after Anglo Rank's link network and that the penalties and notifications will go out in a few days. Starting yesterday, some Anglo Rank customers are claiming they have received such notifications and some have claimed they have seen huge drops in rankings. Now, I have no way of confirming this specific site received this specific notification because of Anglo Rank but this person claims so. Another customer of Anglo Rank claims he saw major drops in rankings, and shared a chart showing the drop in rankings. It will keep working like It was before, they can target few sites here and there but It Is not possible for them to take these private networks down which has 10000s of sites. After this whole tweet thing happened, we did a full backend audit which we do anyway in few days. We went through all the links and checked and replaced all the links which were no longer Indexed In google anymore, when they flag network sites this Is the first thing they do deindex them. The other thing which we are doing right now Is to move all our clients to the sites which were added recently in these networks for example like a week ago, as these sites were added just days ago so there Is no chance they'll be flagged. Thank you for the update but what was you expecting that you gonna be still ranking for 10 years ehhh? thats why i have been mentioning this 10s of times in this thread that this service is blackhat and for churn and burn sites. If you would like us to move your links to a new domain let us know and we'll sort it out for you. It is always interesting to see the fall out and the reaction on this from both the webmasters and owners of the program.